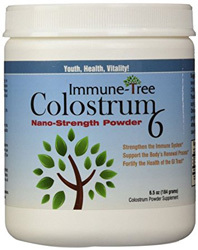 Colostrum6 by Immune-Tree contains natural biological life factors (immune, metabolic, growth) so your life is given 100% stronger support each year it ages. * This “cornerstone” whole food has over 700 constituents that naturally balance and regenerate the body. Contains Colostrum with milk derived proteins. Suggested Use: Adults and children 12+ years: Take 1/2 teaspoon twice daily on an empty stomach. Advanced use: Double suggested use. Anti-aging is not About Adding Years to Life . . . It’s About Adding Life to Years!